Mr. Schlicker is the director of choral activities at Concordia Lutheran High School in Fort Wayne. 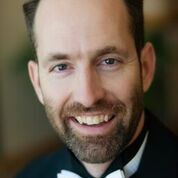 He has lead quality high school vocal programs in Wisconsin, Texas, and Indiana. The Concordia choral program frequently garners gold ratings “with distinction” at Organizational competition and was honored to earn a spot at the Indiana State Finals and receive the ISSMA “All-Music Award” for the past two years. In Texas, choirs under the direction of Mr. Schlicker were annual sweepstakes award winners and competed successfully at regional and state levels. Mr. Schlicker was nominated twice for Texas private school director of the year honors. He is an active regional and national ACDA member and serves on the ad-hoc ISSMA jazz committee as the ICDA District 2 Representative and All-State Coordinator. He also participates on the Fort Wayne Children’s Choir music advisory board. Mr. Schlicker and his wife, Jennifer, have four musical children, of which two are in Treble and Concert Choirs, respectively.